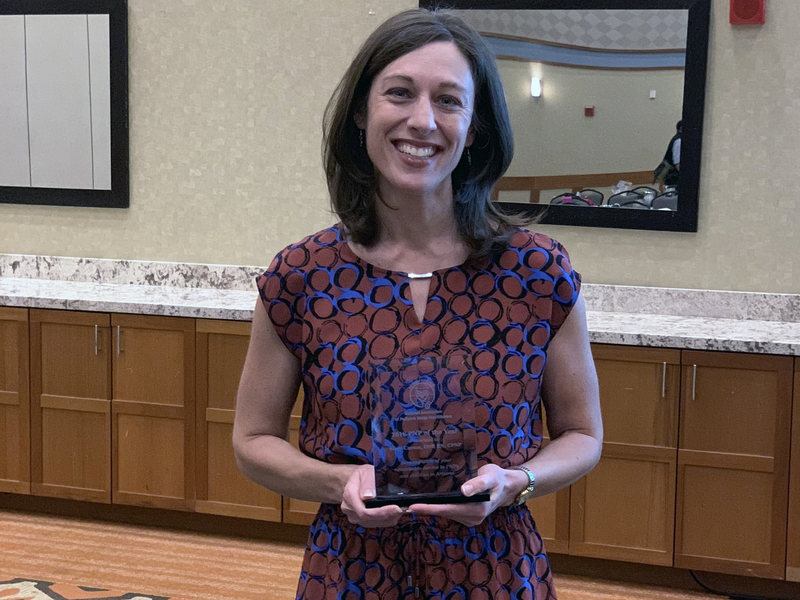 On November 4, UA College of Nursing Clinical Instructor Sheri Carson, DNP, RN, was awarded the Pediatric Nurse Practitioner of the Year award by the Arizona National Association of Nurse Practitioners (NAPNAP). The award is intended to recognize a Pediatric Nurse Practitioner who exceeds expectations as a professional in the field. Dr. Carson was chosen because of her admirable character, selfless dedication and outstanding efforts in elevating her profession in the community. Her dedication to providing exceptional care for children leaves a legacy for other Pediatric Nurse Practitioners who follow in her footsteps. Dr. Carson has demonstrated her passion for improving health care of infants, children and adolescents in various ways. She serves on a Child Abuse Review Education Committee, which investigates abuse cases and provides education to successfully prosecute perpetrators. She has contributed to the scholarship needed to arm parents with the skills necessary to raise healthy children through numerous journal publications and conference presentations. Her dedication to the Tucson community is evidenced by her spearheading a team to walk and raise funds to support melanoma research. Additionally, Dr. Carson volunteers for Pueblo High School’s annual sports physicals clinics and for the UA College of Medicine’s Commitment to Underserved People (CUP) Tot Shots Program, which provides free vaccinations and sports physicals to underserved children. Dr. Carson also regularly mentors local and rural high school students who are interested in pursuing a degree in nursing and/or pediatrics. What does it mean to you to receive the PNP of the Year award? It is an incredible honor for me not only to have been nominated for the PNP of the Year award but also to be the selected recipient. I am truly humbled. I absolutely love being a Pediatric Nurse Practitioner, and having the chance to advocate for children, provide quality care for them and their families, and help educate future nurses, nurse practitioners and physicians about pediatric health care. To receive an award that recognizes my hard work and passion solidifies for me that I chose the right path and that I really am making a difference in the lives of children and their families. What drew you to/makes you most passionate about being in pediatric nursing? When I was completing my pediatric rotation in nursing school, I had a very special experience caring for a young girl who was from Mexico and did not speak any English. I didn't speak any Spanish, and since we did not have translator phones back then, I knew I had to find some way to communicate with her. Each day I would teach her a new word in English, and she would teach me a new Spanish word. We used a lot of pictures and gestures to communicate, and by the end of my rotation, I knew pediatrics was where I wanted to practice. It wasn't just about providing quality nursing care to the children and their families; it was also about walking with them during a difficult time in their lives and helping ensure they had all the tools they needed to properly care for themselves after discharge. Once I became a Pediatric Nurse Practitioner, I translated my passion for education and advocacy into the primary care setting, and I was amazed to find how much I loved caring for children outside of the hospital. Having parents entrust the care of their children to me is truly a privilege, and I always want my patients and families to feel like they are getting the best care possible. Whether caring for a newborn, a toddler, a school-ager, or an adolescent, I have been so blessed to watch my patients grow and develop into amazing young men and women. And having the opportunity to share my knowledge and love for pediatrics with students only fuels my passion for the field. It is a gift to be in this profession, and it's what keeps me coming back day after day. What is the importance of being a member of the AZ NAPNAP? The National Association of Pediatric Nurse Practitioners is the professional association for advanced practice nurses whose focus is in pediatrics. As such, the organization aims to improve the quality of healthcare provided to infants, children, and adolescents. The organization also works to advance the role of pediatric advanced practice nurses in providing quality care to children across the lifespan. By being a member of the Arizona Chapter of NAPNAP, I am afforded opportunities to network with other pediatric nurse practitioners, as well as attend educational symposia and seminars that keep me current in evidence-based pediatric health care. I have had the opportunity to assist with free sports physical clinics and other local events that are sponsored by the Arizona chapter, which helps ensure quality health care and outreach to the children and families across our state. Finally, I have been able to share my doctoral work on creating a comprehensive child physical abuse screening program in the emergency department, which has allowed other PNPs to take this information to their respective organizations and expand the number of facilities who are actively screening children for physical abuse. Aside from the honor of receiving his award from your colleagues, will being PNP of the Year open any doors for further research/career opportunities? I am not sure if receiving this award will open any new doors for me, but my hope is that it will. Recently, my focus has been on disseminating the work from my doctoral project on implementing comprehensive child physical abuse screening programs in all emergency departments across Arizona, and I would love to see this award elevate people's awareness of who I am and the work that I am doing. I have had the chance to present my work at both local and national conferences, and I am actively working to improve healthcare providers' screening for and recognition of child physical abuse. This information was shared as part of my award nomination, which was read during the award presentation, so it is possible that my receipt of this award could support new research and/or career opportunities, especially with regard to child physical abuse screening and recognition.